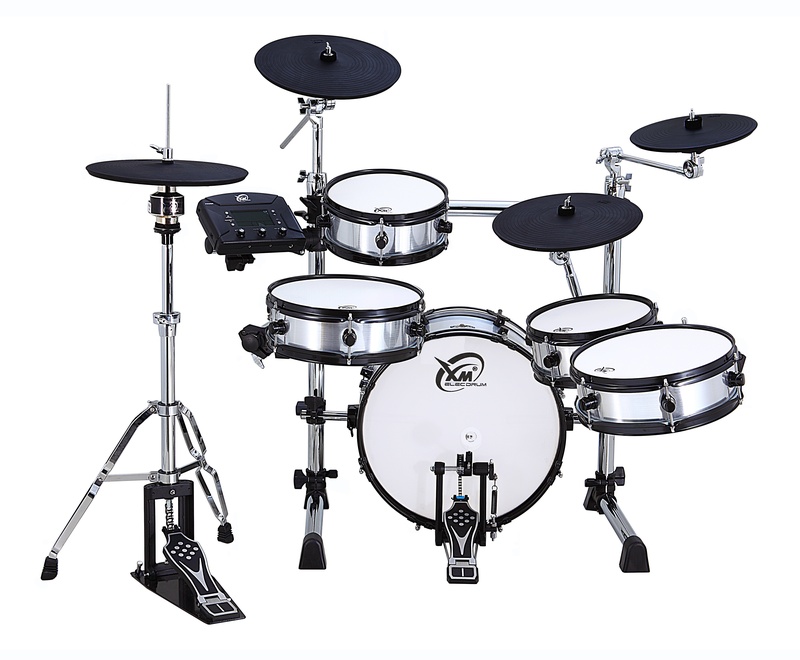 2012 has now seen the release of XM World’s newest addition to its many different series of eDrum kits. The Groove Series, made especially for jazz and funk style drummers has hit the stage, and the result has been a resounding beat of pleasure amongst percussion enthusiasts. 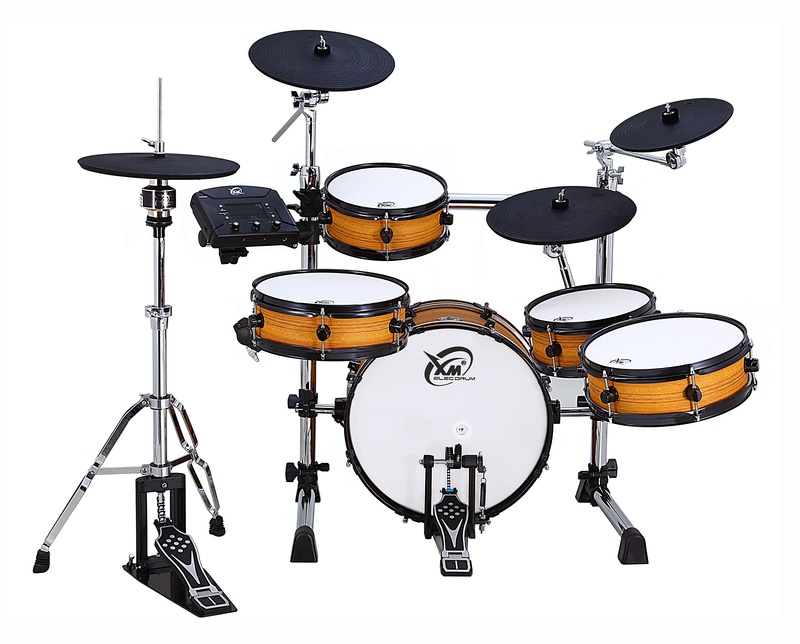 Within XM’s Groove Series there are currently two models to choose from, the J-9SR and the J-8SR eDrum sets. Today, we look closely at what the XM Groove Series J-8SR can do. As soon as you set your eyes upon the Groove Series J-8SR, you know you are dealing with something very special. 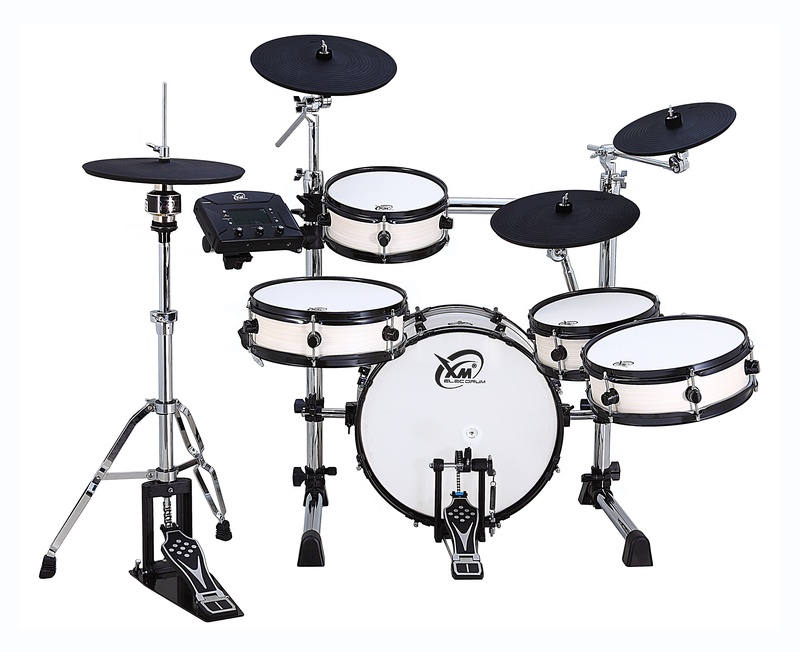 This kit has silver shells with black rims, and looks as professional as any acoustic drum kit you’d see in the shops for a similar cost. You can also get redwood, teak, black, white wood, light brown, dark brown, or red coloured shells. Of course the cymbals are black rubber, as opposed to being metal, but otherwise this is almost a true replica of a small sized acoustic drum kit. The first thing you notice about the J-8SR is how compact it is. This kit sits in an area of 150cm by 130cm, including where the drummer is located. The ramifications of this small size are ironically great. You can practice at home in a small room, and when you’ve got a gig at a local pub, club, or even café stage, the rest of the band will still be able to fit in front of you. XM has spent a lot of time developing its eBass drums, and the J-8SR eBass drum looks great. Forget the days of tiny rubber bass pads; this looks like a real bass drum. It’s 18” in diameter, and utilises XM’s revolutionary Rock Steady Bass Drum System. This rack ensures no matter how hard you kick the bass drum, it will never move. If you’ve ever scratched a floor with your eBass drum’s pin, you’ll know how important this is. 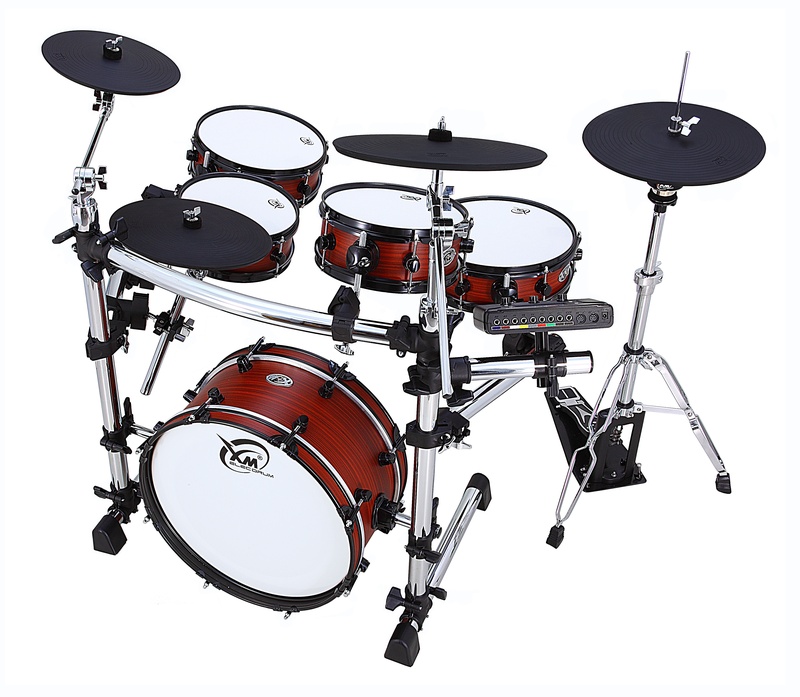 The standard kit also comes with a 12” eSnare drum, two 10” eTom toms, and one 12” eFloor tom. You get two 13” eCymbals, one 11” eCymbal, and the XH7 13” eHi-hat cymbal with hi-hat stand. You still have the ability to expand the kit, as the 8S eDrum touch panel module (also included) supports up to 14 drums or cymbals. In terms of functionality, the Groove Series J-8SR is a true delight of innovation and design for the eDrum world. The snare drum, both toms and the floor tom all have three sounds that can be programmed independently: Hoop, drumhead and rim shot. The bass drum has a single drumhead sound. The two larger cymbals have choke, edge, surface and bell functions, while the third smaller cymbal has a surface sound. This is amazing enough, but there is another level of complexity that you can play with. The 8S module has the unique ability (amongst all XM eDrum series) to have two overlapping sounds emitted from a single eDrum trigger. Two distinct sounds are triggered simultaneously, and can be independently programmed on each drumhead, drum rim, rim shot, or cymbal (surface, edge, or bell), except for the hi-hats. The hi-hat cymbal has surface, bell and choke functions, and can be set to four positions: full open, half open, ¼ open and fully closed (although you choose whether fully closed sounds closed – you may like the cymbal to have that ‘just touching’ sound. Jazz enthusiasts will love the responsive ‘foot splashes’ they can do on the hi-hat pedal. The Full Body eDrum Rack comes with L-Ball clamps, which allow you to adjust each drum’s position to your exact needs. The user-friendly touchscreen module interface is extremely intuitive. 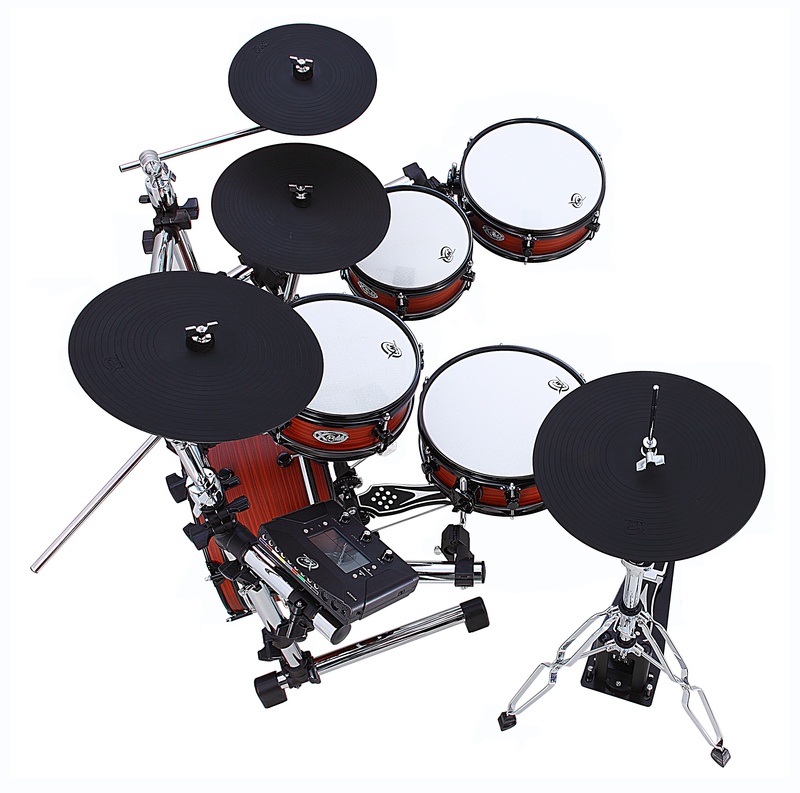 There are seven complete ready-to-use standard drum kits to choose from: Jazz, Funk, Pop, Rock, Effect, R&B and Metal. There is also a metronome function that can be adjusted to perform a wide range of sequenced rhythms for you to play along with. If you’ve been playing eDrum kits for many years, you will be well aware of the gap that has always existed between an acoustic kit and a digital drum set. XM World does not focus on having thousands of digital sounds (although you have the ability to download any sound you like); their aim is to make the crossover between digital and acoustic seamless. They’ve done well here. The responsiveness of the meshhead drum skins is excellent – very bouncy, and the sound is incredibly realistic. XM have sampled sounds from the highest-level acoustic drum kits to create their standard kit sounds, and there is a noticeable difference to the usual sound quality you’ll find in most eDrums. The verdict is in – the Groove Series J-8SR is a professional quality eDrum kit made for jazz and funk musicians, as well as those who don’t have much room at home, but want the best small-sized eDrum kit they can get on the market today.